In-depth analysis of a specific field/part of a project. Artificially created trading volume by crypto exchanges has become an increasingly concerning issue throughout the industry. With the interest in cryptocurrencies rising and their number one use case being speculation, the amount of crypto exchanges who want to get a share in the high-margin revenue market of trading fees is growing rapidly. However, most of these new exchanges use one of three common user interfaces and have the exact same digital assets integrated than other exchanges, so little to nothing sets them apart from their competitors. Accordingly, most of them have difficulties to attract a large number of customers and therefore decided to boost the position of their exchange in ranking sites like CoinMarketCap. As all of these rankings are currently based on trading volume, an increasing number of exchanges started to integrate bots that trade the same coins back and forth, creating hundreds of millions in trading volume even though some of those exchanges have hardly any users. So, how can we rank exchanges differently than by trading volume? Fairly recently, I introduced a method called “order book depth” to rank exchanges by their provided liquidity. The metric displays the amount of coins that can be bought/sold in an order book per market order, without moving the price by more than one percent. Fortunately, with Coinpaprika the first exchange ranking site has stepped up and started to implement the feature. However, in this article I want to make another step forward and run a little comparison of order book depth data against trading volume. 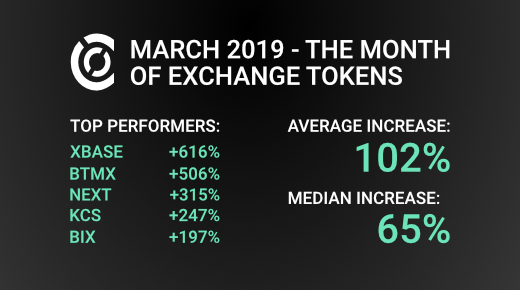 As displayed in the graphic, the exchanges that have been around for a long time are also the ones, that have the highest liquidity. 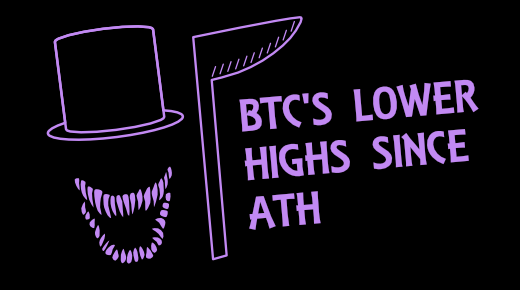 Bitfinex and HitBTC are positioned on the first and third spot of the list, providing enough depth in their BTC/Tether order books to sell over 700 BTC on Bitfinex and close to 500 BTC on HitBTC without hitting buy orders 1% below the current price. The biggest order book concerning the 1% price range of buy orders on the BTC/USD pair is provided by Coinbase Pro (551 BTC), followed by Kraken (430 BTC), Bitstamp (343 BTC) and Gemini (227 BTC). With Liquid, Bitflyer and Coincheck three exchanges also made it into the list, with a BTC/JPY (Japanese Yen) trading pair. However, in contrast to these 15 very liquid exchanges, 89 of the 104 exchanges failed to provide enough liquidity to sell over 100 BTC per market order without hitting buy orders 1% below the current price. Regarding the 1% price range, one could have sold 50-100 BTC on 12 exchanges, 20-50 BTC on 11 exchanges, 10-20 BTC on 15 exchanges and 1-10 BTC on 23 exchanges. On 28 of these 104 exchanges, which all had a daily trading volume above 200k USD in their most frequently traded BTC/Fiat or BTC/Stablecoin pair, one could not have sold more than 1 Bitcoin without hitting buy orders 1% below the current price. How does the evaluated order book depth relate to the reported trading volume of the considered trading pairs on these 104 exchanges? The data suggests that there are three types of exchanges: Some don’t artificially inflate their trading volume, some partly inflate it but have significant real trading volume as well and some exchanges have mostly artificial trading volume and almost no real volume. In the data set, the exchanges with the highest liquidity in their order books mostly generated a double-digit million USD trading volume in this specific trading pair. To name a few: Bitfinex was at 41 million USD, Kraken at 20 million USD, Bitstamp at 28 million USD and Bithumb was at 61 million USD. Remember, these are exchanges with a very high liquidity. Interestingly enough, the average daily trading volume in the evaluated trading pairs across all 104 exchanges was at 43 million USD. So, on average each exchange in the list had more daily trading volume than for example Coinbase Pro or Gemini. To further analyze the connection between trading volume and order book depth, I ran a correlation test between the two. One should expect a slightly positive correlation between the two factors, since they seem to be intertwined. However, that wasn’t the case. While an outcome of 1 in the correlation test determines a perfect positive correlation and an outcome of -1 determines a perfect negative correlation between two input variables, the correlation coefficient between trading volume and order book depth was rated at 0.02. It shows, that both factors are completely uncorrelated and there is not even a slightly positive relationship between them. Let’s declare the trading volume on Coinbase Pro, Kraken and Gemini as real volume. All of these have packed order books, but don’t have that much volume (compared to other crypto exchanges). For example, the order book depth of Gemini, Huobi and Liquid was in the same range in the analyzed data sample (around 200 BTC could be sold with the price not declining by more than 1%), but the trading volume on both Huobi and Liquid (each around 100 million USD) was 10 times as high as on Gemini (around 10 million USD). Adding to these, the daily trading volume on Binance for example was 2.5 times as high than the volume on Coinbase Pro, even though Binance had only 22% of Coinbase Pro’s liquidity in their order books. Does that mean that all the volume on Binance, Huobi and Liquid is fake? No, it doesn’t. Does it mean, that the volume on Binance, Huobi and Liquid is partly inflated with artificial volume? Probably, but not necessarily. Probably the exchanges inflate their real trading volume with artificial volume to attract traders. Probably all their volume is real and caused by traders who just like to trade more on these exchanges than on other exchanges due to a better trading experience or lower trading fees. As long as an exchange provides decent liquidity in their order books, it is hard to prove that their volume is partly or entirely fake. However, fake volume is pretty clearly generated by some exchanges that claim to generate multiple million USD in daily trading volume, but one cannot even sell a few BTC without crashing the price on the exchange. To give you an example: Of the analyzed 104 exchanges, 16 reported a daily trading volume of over a million USD in a BTC/Fiat or BTC/Stablecoin trading pair, but you could not even sell one (!) Bitcoin without making the price decline by more than 1%. These exchanges are clearly trying to trick customers and should be excluded from rankings by trading volume. The biggest limitation of this analysis is its limited dataset. The reported order book depth is based on a snapshot of a single day and was partly refined with trading data from two other days. Unfortunately, there is not yet a central source available for order book depth, which makes the process of collecting data extremely time-consuming. Adding to that, some order books were not fully accessible and were therefore excluded from the analysis. However, that doesn’t mean the analysis is not significant – if an exchange failed to provide liquidity in the snapshot, it most likely can’t provide liquidity in general. Additionally, it has to be noted that the amount of BTC used in the analysis originates from the order books provided by the particular exchanges. Some of these order books may be intertwined because an exchange might display order book entries of other exchanges on their own exchange, that are integrated through a trading API. Furthermore, alongside the reported trading volume, the entries in an order book can be faked. It would be possible for an exchange to make orders disappear in the second a user hits the buy/sell button and make these orders appear again, after the trade has been executed. However, it would certainly damage the reputation of these exchanges, so I am not sure, how long they could sustain a faked order book. I also want to add, that the exchanges mentioned in the list are not necessarily the best crypto exchanges, just because they provide liquidity. A lot of controversy has been surrounding Bitfinex or Tether for the past couple of years and HitBTC has been in the news recently for not allowing their users to withdraw funds. 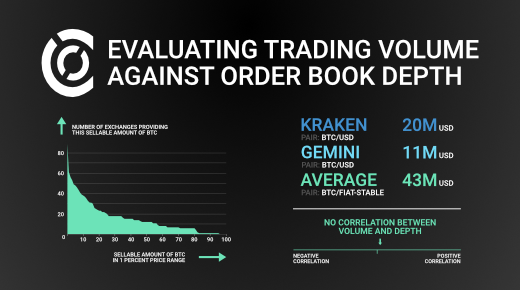 However, this list and the underlying metric of order book depth is thought as an improvement towards ranking exchanges by volume, since trading volume is often understood as liquidity, but in the current state of the cryptocurrency market, reported trading volume and liquidity on an exchange are totally uncorrelated. In this article, I used the method of order book depth to evaluate the trading volume on exchanges. In a data set of the most frequently traded Bitcoin/Fiat or Bitcoin/Stablecoin pairs on 104 exchanges with a daily trading volume above 200k USD, I identified the 15 most liquid Bitcoin exchanges, where one could sell over 100 BTC without the price declining by more than 1%. In addition to these, I showed the allocation of sellable Bitcoin on less liquid exchanges. The average daily trading volume in the evaluated data set per trading pair on each exchange was at 43 million USD, which was higher than the trading volume on some of the most liquid exchanges. As a final conclusion, a correlation test showed that trading volume and order book depth were completely uncorrelated. Utility tokens are a fairly new and innovative asset class. In difference to stocks, where the value highly depends on the performance of the company invested in, the utility token gains value depending on its usage. Whether it is just used as the fuel of a platform or has several use cases across different platforms and products, the price should highly correlate with its number of users. However, in the past we have mostly seen the downside of the utility token in the cryptocurrency market, with major price declines due to no usage and no adoption. With not many successful utility tokens in the market, it is difficult to estimate the potential market cap of utility tokens with adoption. However, outside of the cryptocurrency market, the gaming industry has successfully integrated virtual currencies into their products in recent years, giving us a glimpse of how successful utility tokens could be. 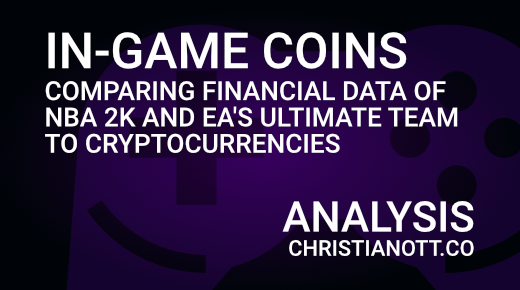 In this article, I will take a look at two successful in-game currencies to see, how their financial data ranks among other cryptocurrencies. Virtual currencies in games are a relatively new mechanism and have been introduced as part of the “Freemium” model. Freemium is a business model where users can play the basic features of a game for free but advanced features or the purchase of in-game items requires payments. After some Freemium titles revealed the potential revenue generated with virtual currencies, major video game publishers also started to integrate virtual currencies into their products. While in some games purchasable items can just be used to change the appearance of an avatar, in-game currencies have seen tremendous interest in games, where the purchasable items can give a gamer a competitive edge over other gamers. This is especially the case in sports games, where gamers can buy better players for their team with the help of virtual currencies. One of these sports games with a purchasable in-game currency is the NBA 2K series. Video game publisher Take-Two has introduced virtual currencies in NBA 2K13 and they have seen tremendous interest ever since. While Take-Two already called the sales of virtual currencies in NBA 2K13 “high-margin revenue”, sales of virtual currencies in the NBA 2K series grew by an incredible rate of 150% in both 2014 and 2015 and by about 70% in both 2016 and 2017. Growth in 2018 has slowed down a bit but is still at a high-flying 34%. Aside from the NBA 2K series, the sports gaming sector is dominated by EA with yearly releases in the FIFA series, Madden NFL series, NHL series and NBA Live series. All of these games have an integrated “Ultimate Team” mode, where gamers can collect players and build a team to compete against each other online. Players can be obtained with coins or points, whereby coins can be gained with in-game success and points can be bought with fiat money. Points enable gamers to buy item packs with different players included in them, which might be better than the players already included in the gamers’ team but might also be a lot worse. So, how would these in-game currencies rank among other cryptocurrencies regarding financial data? They are different from most cryptocurrencies, since those mainly have a fixed supply and an increase in demand results in an increase in price. However, an increase in demand for these in-game currencies just leads to an increase in tokens sold, NBA 2K’s VC or EA’s Ultimate Team points don’t have a max supply and therefore stay at the same fixed price (unless they issue a discount). It makes them easier to compare to ICOs than to the market cap of cryptocurrencies, because with ICOs we usually look at amount of money raised (which is the actual amount of money put into this ICO) while the market cap just multiplies the current price of a cryptocurrency with its circulating supply (e.g. 10 million invested in a coin might result in a 100 million increase in market cap). This net revenue generated in both sports game series by sales of their respective virtual currencies could be viewed as their market cap in the current form the tokens are sold. Every sold token moves from the infinite total supply to the circulating supply with every token having a fixed price. Ranking these market caps in CoinMarketCap’s top 100 ranking places both in-game currencies among the top cryptocurrencies. With a market cap of 3.1 billion USD, EA’s Ultimate Team is ranked below EOS and above Bitcoin Cash on place 6. NBA 2K’s VC would be placed on position 13 with a market cap of 1.2 billion USD below Cardano and above Bitcoin SV. Nonetheless, with the market cap just being an indicator of how much an investor would pay for a purchase of the total supply at the current price, it does not represent how much money went into or out of a particular asset. For example, with just a 24-hour volume of 26.4 billion USD, the overall market cap of cryptocurrencies listed on CoinMarketCap fell from 395 billion USD to 330 billion USD on February 6, 2018, which is a market cap decline of 2.64 times the volume the coins were traded at. So, the question is how much does the market cap of a cryptocurrency increase, if it has a fixed circulating supply and a certain amount of money is invested in it? Due to the fixed price of Ultimate Team points or the VC sold in the NBA 2K series, we know how much money was invested in these during the last couple of years. Take-Two had an estimated net revenue from selling virtual currencies in the NBA 2K series of around 1.2 billion USD in the last 6 years, with an estimated 470 million from fiscal year 2018 alone. However, they did all that with just 9 million copies sold of NBA 2K18 in fiscal year 2018. While this is certainly a high number for a sports game, think about the potential we are talking here. Let’s say an application can create the same demand than the NBA 2K series for their virtual currency but has 90 million users instead of 9 million users. Then we are not talking about 470 million USD put into the token in one year but rather 4.7 billion USD. Connecting that to the fact that one billion USD invested leads to a multi-billion USD increase in market cap, shows us the potential of a very successful utility token. Let’s say it leads to 5 times the market cap, then we are looking at a 23.5 billion USD market cap for that 90 million user application, which is currently around 2x the market cap of Ethereum or XRP. Let’s say it leads to 10 times the market cap (47 billion USD) or Tom Lee’s suggested 25 times increase, then we are looking at a 117.5 billion USD market cap for the application, which is around 50 billion higher than Bitcoin’s current market cap and underlines the huge potential of highly demanded utility tokens. While utility tokens are an innovative new financial asset, the cryptocurrency market has seen its majority of utility tokens stay without many use cases or users, resulting in heavy price declines of these tokens. On the contrary, the gaming sector has successfully integrated virtual currencies into video games. Especially the sports gaming sector has created a huge demand for their tokens by providing gamers with better players in exchange for purchasable in-game currencies. The NBA 2K series or EA’s Ultimate Team mode are perfect examples for this success with the generation of multiple billion USD in net revenue by selling their virtual currencies. If a cryptocurrency reaches a comparable or even higher demand than these games, it would certainly be placed among the top cryptocurrencies and could reach a market cap higher than Ethereum’s or XRP’s current market cap, with even a chance to surpass Bitcoin’s current market cap. A big thank you to “Thinking Gamers”, who made a terrific job of collecting information about the numbers behind virtual currency in NBA2K and gave me a ton of input for the NBA 2K section of this article. The cryptocurrency market is well accustomed to the ICO model. Most projects use the approach of an initial coin offering to finance their idea via crowdfunding, with investors receiving a substantial portion of the coins of the invested project in return. From the start of these projects, most of the coins are held by investors and there will be little to no influx of new coins. Only a few projects use a long-term distribution model, in which just a slight portion of coins is released at a time and the distribution is executed over years. Skycoin belongs to this group of long-term distributed coins and we will take an in-depth look at how its distribution is executed. As the chart shows, the circulating supply increased periodically. It looks like the distribution was either made directly from the wallet (slow growth) or the coins were taken out of a distribution address completely and were then distributed (sudden growth). Nonetheless, there were some distribution events, that we can attach to this chart. The first initial public offering was announced in early 2014.5,6 It was held one year later in April and May 2015,7,8 where about 450 thousand Skycoin left the original distribution addresses. To be fair, it was not an usual IPO, it was more a private sale to dedicated early followers/contributors,9 who would not shy away from compiling the wallet on Linux.10 Because of the difficulties that came along with this early IPO, the team offered to continue selling Skycoin for the same BTC price of the IPO, until a circulating supply of about 2 million Skycoin would be reached.11 If they actually sold more than 2 million from the first 3 million Skycoin distributed in 2015 and 2016 is hard to determine. What we know so far, is that 1 million Skycoin were sold to a large investor or a consortium of investors, that were held in one address. The coins were sent to this address in September 2015 and have recently been sold.12 Concluding from that, an amount of 1.45 million Skycoin have evidentially been distributed via sales in 2015. Therefore, I would estimate that another 550k were sold to early followers, while the remaining 1 million Skycoin from the first 3 distribution addresses were distributed to team members and project contributors. After some testing of a Skycoin distribution on a third-party platform,13,14 the next big distribution event was held on the exchange C2CX in early 2017. About half a million Skycoin were sold in this event.15 Followed by this success, another distribution event was held on C2CX in August 2017, where 1 million Skycoin were eligible to be sold to the public.16 However, since I couldn’t find any source indicating how many Skycoin were sold of these 1 million Skycoin available and the coins were sold for twice the market price Skycoin was traded at back then, the distribution event probably wasn’t very successful. I would guess, that about 10% (100k Skycoin) of the available coins were sold in the event. Overall, the Skycoin distribution was pushed forward in November and December 2017 with over-the-counter sales, with Skycoin being both sold manually and fully automated via the Skycoin website. About 50 thousand Skycoin were distributed in the automated OTC, which can be seen in the Skycoin explorer (automated OTC address).17 Determining the amount of Skycoin sold via manual over-the-counter sales is more difficult. The amount of Skycoin sold in these sales was rather high, as Synth has stated in an interview.18 One address alone has received 1 million Skycoin in December 2017, which I suppose is an OTC sale to a large investor (or a consortium of investors). Given that 4 million Skycoin were put into circulation in 2017, I would estimate, that another 1 million Skycoin were sold via OTC sales in addition to the 1 million Skycoin distributed to the large investor address. In December 2018, the circulating supply started to increase from 10 million to now 13.7 million Skycoin at the beginning of March 2019. It can be assumed, that most of these coins were distributed via OTC sales,27 so I would estimate around 3 million Skycoin from these 3.7 million introduced to the circulating supply from December 2018 to March 2019 have been sold over the counter. Skycoin also started trading at the crypto exchange LBank, which (according to an analysis of Skycoin’s blockchain) has received around 50k Skycoin for liquidity and airdrops. The numbers shown in the graphic add up to a total of 9.195 million Skycoin, that have been mostly distributed via sales. 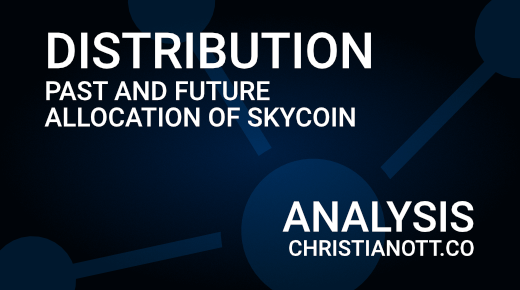 The circulating supply right now is at 13.7 million, although we have to consider that the Skycoin project didn’t necessarily distribute the coins directly from the distribution addresses, but rather took them out all at once and then placed them in several smaller distribution addresses. It is therefore possible that the real amount of Skycoin in circulation is lower than the amount displayed in the Skycoin explorer. Nevertheless, I can’t tell how many of these have been distributed, so let’s say 13.7 million is the actual circulating supply. Considering that approximately 8.5 million Skycoin were sold, (only) 62% of the circulating amount of Skycoin have been distributed via sales. So, what has happened to the other 38% of coins in circulation, that were not sold in distribution events? Unlike most other cryptocurrencies, the Skycoin project prefers to use a long-term approach for the distribution of Skycoin. Of 100 million Skycoin, about 13.7 million were distributed in four years since the first ICO in April/May 2015. From now on, I estimated, that 6.25 million Skycoin could be distributed per year, until 25 million Skycoin would be in circulation at the end of 2020. After that, 5 million Skycoin could be distributed per year, so that there could be 100 million Skycoin in circulation at the end of 2035. Talking about the target audience of these distributions, the project wants to not only distribute Skycoin via ICO and OTC sales, but also use the coins to incentivize bandwidth providers in the Skywire network and to generally reward people who contribute to the project. All in all, I hope this article increases the transparency about the Skycoin distribution and provides answers towards most questions around this subject. Please refer to my blockchain analysis of Skycoin, where I dedicated one paragraph to this address. It was on January 8, 2018 when the overall crypto market cap reached its peak of 828.5 billion USD. It was the peak of a phase of seemingly never-ending euphoria, and cryptocurrencies were said to be the new financial paradigm. From that point on, the cryptocurrency market moved into a totally different direction, with many coins/tokens losing over 90% of their fiat value in less than a year. 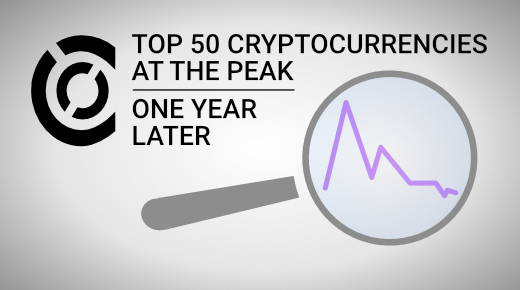 In this article, I will take a look the TOP 50 cryptocurrencies at the peak and how they are positioned on the exact same day one year later. A comparison between different years for cryptocurrencies can be done with different parameters. You can base the calculation on the price, but that doesn’t consider (logical) price declines due to increases in circulating supply. The market cap of a cryptocurrency should therefore be better suited for a comparison, since it both includes price and circulating supply. The market cap itself is often referred to in USD, but due to most altcoins’ fiat value depending on Bitcoin’s fiat value, comparing the market cap in BTC should give better insights on how a coin performed over time, than it’s fiat value. Accordingly, in the following you can find the market cap of the TOP 50 cryptocurrencies on January 8, 2018 compared to their market cap in BTC on January 8, 2019. As we can see, there are only four coins in last year’s TOP 50, whose market cap was worth more in BTC, than it was one year later. EOS’ market cap gained 66.6% in Bitcoin, Binance’s market cap gained 80.8% and stablecoin Tether’s market cap gained 388% in Bitcoin value. Bitcoin’s market cap was also worth more (in terms of BTC) than it was one year ago, due to an increase in circulating supply. The market cap of all other 46 coins/tokens lost value against BTC, some less (Stellar lost only 21%), some more (DENT lost 90%). 36 coins remained in the TOP 50, while five coins even moved out of the TOP 100. One coin died completely, which is the infamous Bitconnect. On average, the market cap of coins/tokens in the TOP 50 lost 50.4% in Bitcoin value. The peak of the overall crypto market cap also meant a peak for most coin’s prices. With BNB, EOS and USDT, only three coins would have gained value against BTC, if you had invested in them at the peak of the market. But even they couldn’t gain value against USD. Besides stablecoin Tether, the best investment from a perspective of keeping your fiat value would have been Binance coin – it’s price in USD went down “only” 63.4%. If you would have invested an equal amount in each TOP 50 coin at the peak, you would have lost 88.9% of your fiat value compared to exactly one year later. The cryptocurrency market peaked at January 8, 2018. A comparison between the valuation of coins/tokens on this day and one year later is best done by comparing their market cap in Bitcoin value. At the peak, only an investment in Binance Coin, EOS and USDT would have gained value against BTC, while the average market cap of TOP 50 cryptocurrencies lost 50.4% of its value in Bitcoin. Talking about the TOP 50’s price valuations in USD is even more devastating: Binance coin lost the least with only 63.4% of its USD value, while the TOP 50 cryptocurrencies on average lost 88.9% of their USD value. Let’s hope for a better 2019. Recently, I put a spotlight on using the all-time volume weighted average price (ATVWAP) to evaluate, whether the price of Bitcoin is overbought or oversold (find the detailed article here: Bitcoin ATVWAP). It is basically an average daily price, with every price point being weighted by its daily trading volume. The ATVWAP is not limited to BTC though, it also offers interesting insights for the price of other cryptocurrencies. In this article, it will be applied to the second highest ranked cryptocurrency on CoinMarketCap, which is Ethereum. During these 3.5 years of public trading activity, ETH went from lows around 0.5 USD all the way up to 1400 USD. During the course of 2018 however, Ether has seen its biggest decline. When it hit 82.83 USD on 2018-12-15, it was down 94.2% from its previous all-time high. At that point, many people were screaming for Ether to go even lower, but it has recovered a little instead and went up to the 150 USD range again. Ether’s price movements should provide interesting data to apply it to the ATVWAP. As the chart shows, ETH’ price action was very bullish from its ICO onwards to the end of 2017. After listing 10x above its ICO price on public exchanges, it dropped down to 0.5 USD, but stayed above its ICO price of 0.3 USD. Later on, it went up from 1 USD to 15 USD in the first 75 days of 2016 and stayed in the range of 7-15 USD for almost a year. Then, from the beginning of 2017 on, ETH had its biggest run up from under 10 USD all the way up to 1400 USD, followed by a massive price decline in 2018. Now, which role does the ATVWAP play? There are some interesting similarities between how Bitcoin’s and Ether’s price behaved towards its ATVWAP. We had seen, that Bitcoin had a massive run up two times and after that hovered around the ATVWAP for months (in 2012 and 2015). Similar to that, ETH hovered around its ATVWAP after two run ups. The first occasion where this happened, was during the last months of 2015. 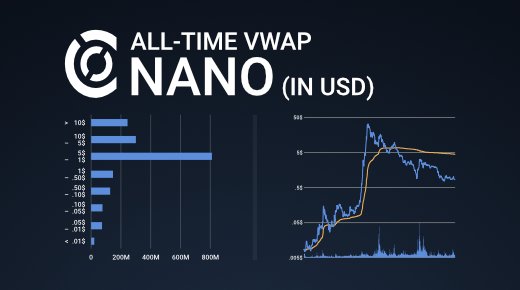 After being issued for 0.3 USD in its ICO, ETH reached 3 USD on exchanges and later consolidated in the 0.8 – 1 USD range, while its ATVWAP was at 0.75 USD. The second occasion, in which the ETH price hovered around its ATVWAP, was at the end of 2016. After having failed to pass 15 USD on multiple attempts in 2016, ETH went down to the range of the ATVWAP again in December 2016, which was at that time at 7.8 USD. After its major run up in 2017 however, ETH declined below its ATVWAP value and has stayed below since August 2018. Its ATVWAP had been as high as 304 USD in August, but due to ETH having stayed below for several months with way higher volume than before, its ATVWAP has already declined down to 250 USD. Accordingly, we have yet to see a longer consolidation period around the ATVWAP value, which would only be the case, if ETH behaves similar to both previous occasions. Ethereum’s price movement against BTC over the past 3.5 years is very interesting. It had three major pumps and massive declines after that, but it could establish a higher support level after every pump. It can also be noticed, that each time ETH had a major decline, it went below its ATVWAP value, only to snap back above it after a while again. Moreover, every time it climbed back up above the ATVWAP level, ETH had a parabolic move upwards. Following the massive decline in 2018, ETH seems to surge to its ATVWAP level again, but if we see a parabolic move upwards after it managed to get above its current ATVWAP level of 0.044 BTC remains to be seen. 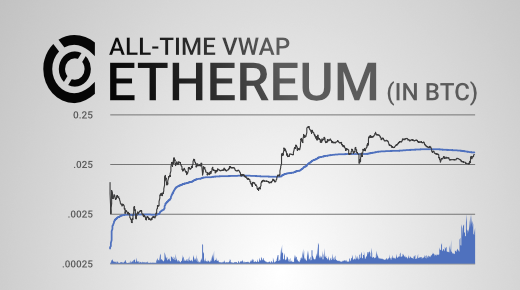 In this article, I discussed the all-time volume weighted average price (ATVWAP) as a method to analyze Ethereum’s price. While it is both possible to analyze ETH’s price in relation to its ATVWAP in USD and BTC, analyzing the price in BTC appears to be more promising, because it includes less correlation with Bitcoin’s price in USD. The chart shows, that ETH had three declines below its ATVWAP value (in BTC) in the past, but always managed to climb back up again, followed by a parabolic move upwards. Currently, it trades below the ATVWAP for the fourth time, but seems to be on its way to recovery again and might touch its current ATVWAP value in the near future. Ethereum received 31,538 BTC in their crowdsale in 2014. During Bitcoin’s recent sell-off from 6,300 USD on Nov 14th down to a (up to this point) low of 3,456 USD on Nov 25th, I saw many posts on Telegram, Reddit and Twitter expressing “hopium” for a price rebound due to Bitcoin’s daily RSI being in oversold range. But is that even backed by facts or is an oversold RSI just a meme? Let’s find out! The “Relative Strength Index” (RSI) is a momentum indicator used in technical analysis, that measures the magnitude of price movements on a scale of 0-100.1 Its main purpose is to identify whether the price of an asset is in overbought, neutral or oversold range.2 An RSI value below 30 is commonly perceived as oversold, indicating a future uptrend, whereas an RSI value above 70 is perceived as overbought, indicating an upcoming downtrend.3 In general, the lower the RSI value, the higher the chance for the price bouncing upwards and the higher the RSI value, the higher the chance for the price going downwards. However, it is not guaranteed that the price will move in the direction indicated by the RSI. 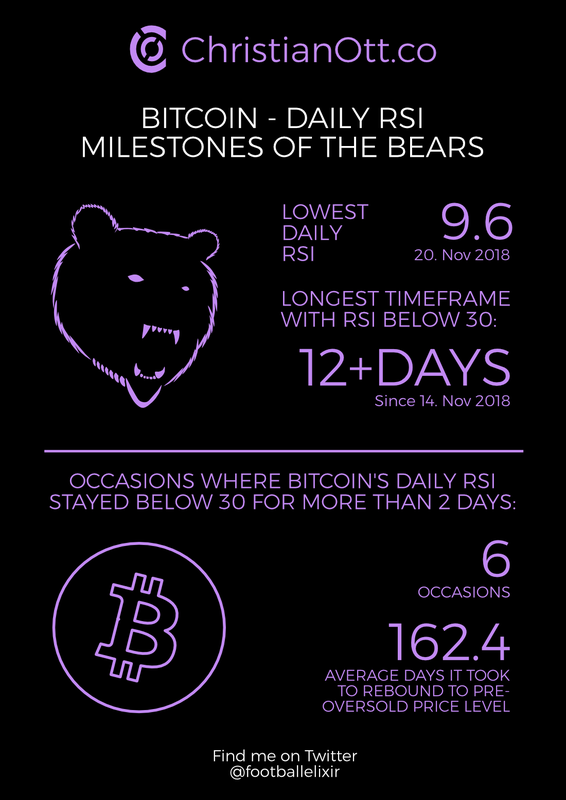 So, how did the daily RSI behave for Bitcoin in the past? The “BraveNewCoin Liquid Index for Bitcoin” on Tradingview provides us with data about Bitcoin’s price movements from 2010 onwards. Since Bitcoin has been an incredibly bullish asset in the past, it has way more upticks to the overbought zone than downticks to the oversold zone. In fact, most of the time Bitcoin went below 30 on the daily RSI, it went back above it again in the following two days. There have only been five occasions in the past, where it stayed below 30 for more than two consecutive days. One occurred in 2011, one in 2012, and three in 2014. Since an RSI value in the oversold range should indicate an uptrend, I analyzed how long it took to get back to the closing price of the day before the RSI value went below 30. Two times (in October 2012 and October 2014) the price rebounded quickly, reaching the previous closing day price within a couple of weeks (10 days in October 2012, 23 days in October 2014). On two different occasions it took around two months for the price to recover (57 days in September 2014 and 66 days in October 2011). However, in opposite to these four rather quick rebounds, it took nearly two years for Bitcoin’s price to reach 568 USD again, which was the closing price on 12th of August in 2014, before it went into the oversold range on August 13th (and went back into the neutral zone on August 19th). Comparing the recent sell-off in terms of RSI value to these other five occasions, shows that the recent sell-off is a historical milestone for the bears. Never in the history of Bitcoin has the RSI value stayed below 30 for more than 6 days, whereas we are now approaching the 13th day of Bitcoin’s daily price remaining in oversold range. 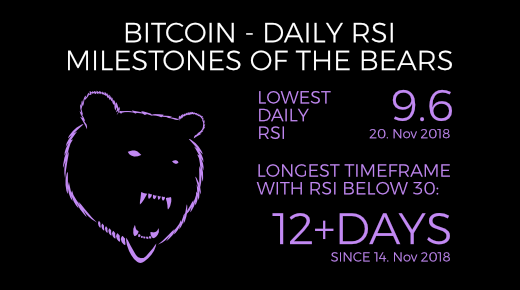 The daily RSI value has also produced several new lows, setting a new record low at 9.6 a couple of days ago on 20th of November, 2018. The historical RSI movement of Bitcoin in the past two weeks showed us, that even after 8 years of Bitcoin trading, new patterns can evolve. Bitcoin’s RSI value on a daily timeframe has never been this low and has never stayed this long in the oversold area. The RSI value being this low is an indicator for a higher probability to enter an uptrend, than with the value being above 30. However, it could only rebound in the short-term and a higher probability of an uptrend still doesn’t guarantee an upwards movement. As we saw in 2014, it could take years to go back to the daily closing price before entering oversold range, although most people in the cryptocurrency market would presumably appreciate a quicker recovery. 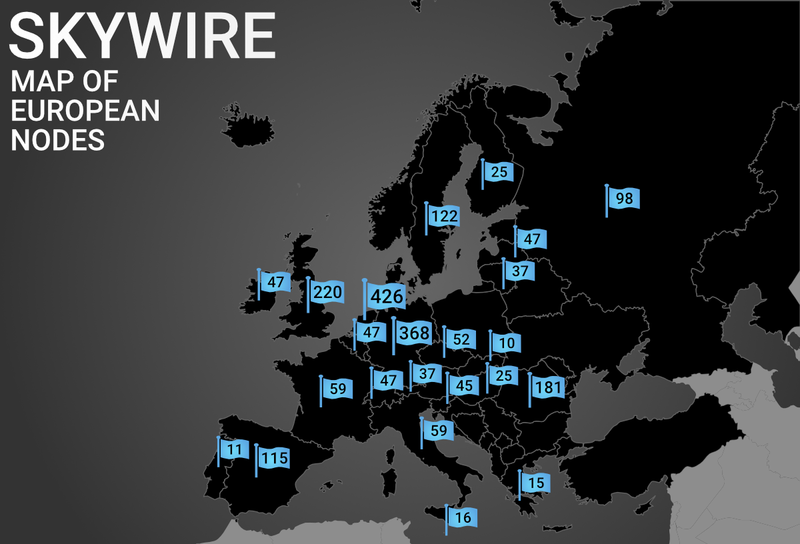 The number of participants in the Skywire testnet is growing. Over the past two months, about 2500 nodes joined the network. Most of the participants are from the United States (2300 nodes) and Europe (2080 nodes). The locations that contain the most nodes are California (747 nodes), Shanghai (395 nodes) and Texas (208 nodes), while not a single node is hosted in other countries like Poland and Turkey. As we could already conclude from the first Skywire node location analysis, there are local network effects that make the network grow. I can’t tell if this is coming from people who motivate their friends to build miners or people build them on their own and place them in various residences, but local network effects seem to be existing. Furthermore, the regions with the most nodes right now might also be the ones that grow the quickest, if there are already enough people at this point to spread the word about Skycoin. It is actually a good thing to see nodes popping up in huge numbers in similar regions, because these nodes will be able to connect to each other once the Skywire meshnet is running.